Wichita State was nasty on defense against Illinois State, holding the Redbirds to 27 percent shooting on the night. WICHITA, Kan. — Cleanthony Early and Ron Baker each scored 11 points, and No. 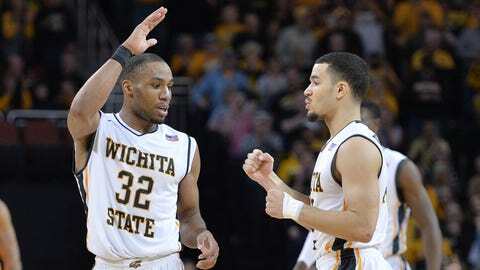 6 Wichita State cruised past Illinois State 66-47 on Wednesday night with tight defense and a balanced effort. Wichita State (16-0, 3-0 Missouri Valley Conference) extended both the longest winning streak and best start to a season in program history by holding Illinois State (8-7, 1-2) to 27 percent shooting (18 of 55). Bobby Hunter scored 11 points to lead the Redbirds, outrebounded 44-37. Already up by 13 at halftime, Wichita State started the second half with seven straight points. Chadrack Lufile scored the first four down low, and Tekele Cotton hit a 3-pointer for a 44-24 lead. An 8-3 Shockers run featuring Nick Wiggins hitting a 3-pointer and converting an alley-oop slam pushed their advantage to 54-30 with 10:53 remaining. The spurt also contained the worst moments of the night for Wichita State. Starting point guard Fred VanVleet had his left leg bent awkwardly in a fight for a rebound. VanVleet immediately fell to the floor before walking to the locker room to be checked by doctors. VanVleet has been Wichita State’s best player lately. In the previous four games, he averaged 18.3 points while compiling 21 assists and just one turnover. So the crowd was subdued until Baker motioned for noise after throwing the alley-oop pass to Wiggins. VanVleet soon returned to the bench and played much of the final 10 minutes, finishing the game with six points, 10 assists, seven rebounds and no turnovers. Wichita State cruised upon his return. Carter’s layup off VanVleet’s alley-oop pass gave Wichita State a 63-40 lead with 3:54 remaining, and Wichita State coach Gregg Marshall started calling for walk-ons to enter the game. The Shockers started taking control midway through the first half. After a 3-pointer from Illinois State’s Paris Lee made the score 14-12 Shockers, Baker answered with a deep 3 to beat the shot clock buzzer. That started a 17-4 Wichita State run that featured 3-pointers from Baker and Cotton. The Shockers’ first-half advantage grew to as many as 15 after two free throws by Baker made it 31-16 with 4:14 to play in the half. Darius Carter’s flying tip-in at the buzzer gave Wichita State a 37-24 halftime lead.